I'm delighted to welcome Andy Gavin, author of The Darkening Dream, to my blog today. The Darkening Dream blends vintage horror with Buffy the Vampire Slayer, setting teenagers from the early 1900s against vampires, demons and more, and bringing a wealth of religious imagery to bear. You can find my review of the Darkening Dream here, but seriously, I'd recommend you read Andy's post instead. It's much more interesting. In constructing The Darkening Dream I wanted the meta-story to play off conventional tropes. Broadly, a cabal of ancient supernatural beings has sent one of their number to recover an artifact needed to destroy the world. And surprise, it turns out a group of teens are all that stands between them and Armageddon. How much more Buffy can you get? 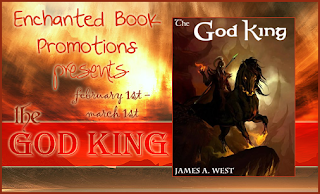 I reviewed James West's The God King last week (see review of the God King by James West), and today I'm privileged to have him here on my blog answering some interview questions. I really enjoyed this interview and learned a lot about what goes into writing and creating fantasy. I'm sure you'll enjoy the interview too, and don't forget to leave comments and ask your own questions at the end. Okay, the pages of a book can get torn, I can spill things on them, and they bend if I sit on them. But seriously, paper doesn't break, and computers and kindles can drive me up the wall. I'm gazing at a stretched out screen at the moment because my computer keeps losing communication with the monitor. It might all go black and turn into an ordinary screen soon. Meanwhile nothing's where I expect it to be--even moving the mouse feels all wrong--frustration! Gaghghgh! When I've finished this post I'll probably go back to reading and reviewing a book, having finally managed to load it onto my kindle. First attempt it just didn't transfer. Second attempt it wouldn't open (and the kindle crashed). Third time's a charm. Gaghghgh! Or maybe I'll write, except then I'll be stuck with this crazy screen that keeps flickering and changing on me. Perhaps I should just go out and do some yardwork while the sun still shines. ... and then I logged out of emails and went to my website (built with Blogger, part of Google) to check how it looked. It looked blank, blocked, gone. I searched (with Google) for help, then felt foolishly inspired to check for an email explanation. But I couldn't log in; my emails were likewise blank, blocked, gone. So I checked my phone where a nice warning triangle told me all my accounts were unavailable. Me, I like both, especially when they're packaged in the same book. I read and reviewed Karen Wyle's Twin Bred some time ago, an exciting novel with lots of twists and turns, plots and sub-plots, ethical dilemmas, and an alien race worthy of Orson Scott Card, plus believable science and a just a gentle hint of fantasy. And I heard it's available free, just today (well, yesterday too, but that doesn't help you) on kindle, so why not give it a try. I recently read and reviewed Carolyn Moncel's 5 reasons to leave a lover, a novella and two short stories that deal with love, cheating, cruelty, deception, ambivalence and death. The stories, like the author, travel the world from the US to Europe, and, as an English American, I wondered if the author felt the "reasons" might be viewed differently from different cultures. Carolyn Moncel very kindly gave me her thoughts on the subject, so, over to you Carolyn, and thank you for visiting my blog today. A few years ago I joined my first social networking site, Gather.com, and met, amongst other good friends, a wonderful lady called Sarah Collins Honenberger. Knowing she was a genuine published author (I bought and enjoyed her first book, White Lies), I was amazed by Sarah's kind and encouraging comments on my writing. So, when she suggested I submit something to an online magazine, I plucked up courage and asked which one. Sarah suggested NightsandWeekends.com, who had already published something of hers (Night Noises). So I tried, and they said yes. My journey began! Some time later Sarah Collins Honenberger's second book came out, Waltzing Cowboys, and she offered me a book exchange, her second real book for my second self-published one! A real live author actually my book and wanted a review from me! And so my years of book-reviewing began. I recently read and reviewed S. R. Johannes' tween novel On the Bright Side, first in her Starling series, and was delighted to get the opportunity to interview the author. A novel filled with zany puns, heavenly remakes of modern technology, green issues and high school disasters... where does it all come from? 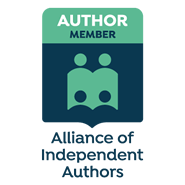 Well, here's your chance and mine to find out, plus some interesting hints on the joys of writing and getting published.